IS THERE A DIFFERENCE BETWEEN MAPLE SYRUP AND TABLE SYRUP? Believe it or not, this is the most popular topic, in terms of visitors, that Neil ever wrote about on the blog. What do you like on your pancakes? Catharine and I often have brunch at a well-known Montreal restaurant named Beauty’s. We always order the same items. Fresh orange juice, blueberry pancakes and bacon. Catharine orders the more expensive real maple syrup. I use the regular table syrup and it is perfectly satisfactory to me. 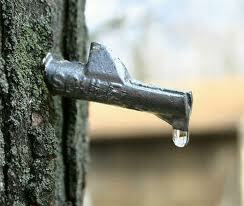 It is true, however, that it is all too easy to misrepresent real maple syrup. Rigtht now two American senators have a bill in the hopper that would impose tougher sanctions for the marketing of other syrups as maple syrup. Table syrup is sickly sweet. While maple syrup may be expensive, even a small amount transforms a plain waffle or pancake, a simple slice of ham or cube of tofu, or a mustardy salad dressing. Previous Entry: IS ISRAEL’S ATTACK ON GAZA APPROPRIATE? Next Entry: SHOULD BUSH CRITICIZE RUSSIA?